The calamari recipe Balado and How to Make -Varian dishes of squid are very numerous and varied. One of them is squid Balado. Balado calamari is cooked with a spicy sauce and manufacturing process was fairly easy. 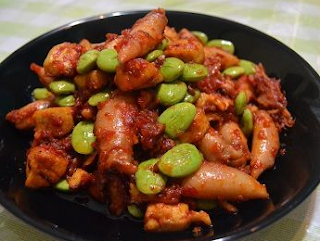 If you are interested in making it and are curious about the taste, here is the recipe squid Balado we have described briefly so that you can easily make your home. The first step, Clean the squid, then coat with lemon juice and salt. Then leave for more than 15 minutes. Furthermore, sauteed spices and lemongrass input along with the bay leaf, salt and ginger. Then stir until fragrant. Then enter squid along with a banana (if desired) and add a little water, then stir well and let stand until the water looks somewhat reduced. Lastly, enter the basil and stir briefly. After that lift and artificial squid Balado you ready to be served. 0 Komentar Untuk "The calamari recipe Balado and How to Make"